I wrote this yesterday and it didn't post, so now get belated Random Tuesday on Wednesday for a slightly more random dose of random. A lot of publishers and authors have been releasing the covers for their upcoming winter and spring 2014 catalogs. A number of them caught my eye, but my absolute favorite comes from Working for the Mandroid friend and awesome zombie-fighting author Susan Dennard. Isn't that an amazing cover? I can't wait to see how Eleanor's adventures in Egypt turn out. Susan spoke with fellow author Amie Kaufman at their blog Publishing Crawl at by the next book in her Victorian zombie adventure series. Amy Plum has an action fantasy series starter coming out next May and it also has a pretty awesome cover. The story opens when a beautiful girl wakes up in an abandoned subway station with no memory of how she got there. When men try to hurt her . . . they wind up dead. Where did she come from? And what is she capable of? I was pleasantly surprised by not-really-a-zombie-but-staring-a-zombie book Reboot and the sequel, coming out on May 6 has a very intriguing cover. Alternate faerie tales are all over the place and The Wizard of Oz already has a take on it with Gregory Maguire's Wicked series. 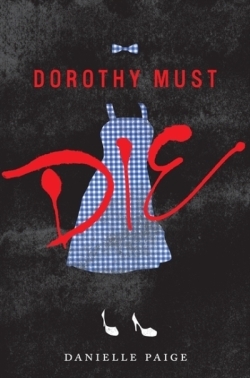 Now Danielle Page is bringing the popularity of dystopias to the Emerald City in Dorothy Must Die, coming out April 1. Epic Reads released a whole slew of covers over the last few weeks and you can see all of them along with their release dates here. And that's the pretty cover edition of Random Tuesday. What covers and random things have caught your eye lately?